Mike Pyle is in Corpus Christi, Texas ready to take on Jake Shields in the co-Main Event of the Elite XC card on Showtime. 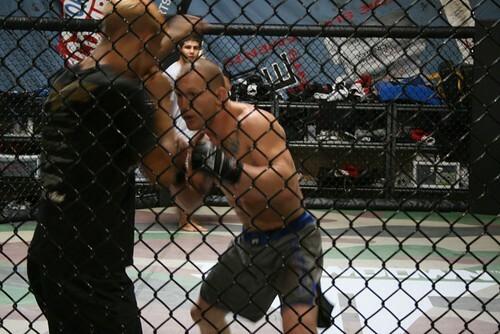 Mike had an incredible training camp, looks sharp and is ready to make his name known. If you’re unfamiliar with Quicksand Pyle, he’s well versed in Jiu Jitsu and Muay Thai. 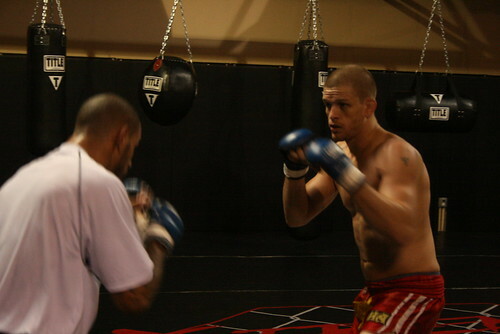 Mike taught himself how to fight as a teenager in Tennesse. He put mats in his mom’s shed and taught himself jiu jitsu while beating up his buddies (who he bribed with beer) and watching tapes. He is a consummate competitor who never backs down from a challenge. He fought Quinton Jackson at the beginning of his career in a fight many people feel could have been judged his way, he took on Andrei Semenov in Russia, beat Jon Fitch and Shonie Carter, held the WEC Welterweight Title and competed in the IFL at 185lbs a weight class above his fighting weight. If he and Jake Shields had been promoted better, this fight could be headlining one of the biggest Pay Per Views of the year. On paper it has FIGHT OF THE YEAR CANDIDATE written on it in big, bold letters. Maybe in a way, it works out for fans that they get to see it for free Saturday. Both Mike and Jake are class acts and great fighters. Jake may have an advantage in jiu jitsu (but not by much), Mike has the advantage standing and may have an edge in wrestling. Expect a tremendous bout when they step in the cage with lots of takedowns, submission attempts, reversals and scrambles. Basically expect it to look like a Tyson Griffin fight. Elite XC airs this Saturday at 10pm ET/PT. Mike “Quicksand” Pyle is ready. November 10th he goes into the cage with Jake Shields as a featured fight for Elite XC on Showtime. Mike has been working out like a maniac for this fight and is in the best shape of his career. Boxing coach Ron Frazier marveled at his improved punching power and accuracy earlier today. There have been rumors about a fight between you and Jake Shields since mid summer. Is this a fight you’ve been looking forward to? Yes. It’s a fight I’ve been looking forward to. Does Jake being ranked in the Top 10 at 17olbs make this fight more appealing? No, not at all. he’s just another person with 2 arms and 2 legs like me. Does the attention Jake has been getting bother you? Elite XC signed you to a 3 fight deal at the beginning of this year. This is your first fight on TV. Are you disappointed with the way Elite XC promoted you? Exactly. I wanted to be promoted on TV and then have a title shot. Thats what I’ve been asking for. I wanted to get on a main card and showcase my skills then move on to a title shot. They didn’t want to work with me that way. So I chose not to extend my contract at this time. Is this your last with w/ Elite XC? It’s the last fight on contract. Resigning a contract is possible. They asked me if I wanted to do this as a title fight. I said no. Because this is the last fight on my contract and I didn’t want to resign with them right now. So I didn’t want to fight for the title. They offered the title fight 5 weeks out when I was training for 3 round fight. That is unclear. There are plenty of options on the table, plenty of people to negotiate with. There are some organizations I’m leanig towards more than others. I want to go with who I think will promote me best. You and Jake are two of the best jiu jitsu guys in the world at 170lbs. Your Muay Thai is also top notch. Is that going to be the difference in this fight? 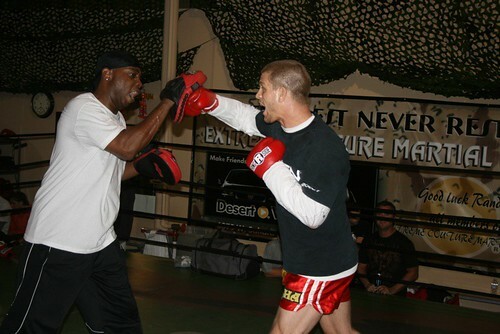 I think my striking is a bit sharper than his and he might possibly have an edge on me with the wrestling. I feel like I’m a physically stronger athlete and will be on fight night because of my preparation. Do you want to beat him because he’s one of Elite XC’s poster boys? Beating him because he’s their poster boy isn’t a big deal to me. The more important thing for me is Jake’s history and that he’s a ranked fighter on these fight polls. He’s got a name that fans recognize. Beating him will be a good step for me. Since your last fight in June there have been rumors you getting a fight several times, but nothing had been signed until September. Are you frustrated by being on the shelf for 5 months? It didn’t really bother me. It gave me some time off. Some time to work on my game. I don’t suffer from ring rust because I’m always in training with top athelets. 5 months off is nothing for me. I can always come back just as strong if not better. Team Couture has been on a tear recently. Winning 14 fights in a row. Is that something you take pride in, being part of a top MMA team? I couldn’t be happier for the team’s success. There’s a lot of camaraderie here. We’re like a family. That’s what makes us so strong. We all come together and help each other win. That’s what I’m looking to continue when I get in there with Jake. I’m going to represent this team to the best of my ablities. To the Quicksand fans: you will get a show like you always do. Thanks for your support. Tune in Nov 10th on Showtime as I take on Jake Shields in Elite XC. Sit back and enjoy the show. Xtreme Couture members are spread across the country, ready to wage battle in four states today and tomorrow. Mike “Quicksand” Pyle and The New York Badass Phil Baroni are in San Jose, California for tonight’s Elite XC/Strikeforce card. Pyle takes on Aaron Wetherspoon the former King of the Cage Welterweight champ. You can see that fight on Proelite.com for free at 7:30 eastern/4:30 pacific time. While in the Main Event on Pay Per View Baroni looks to shut Frank Shamrock’s trap and knock out the self proclaimed legend. Tomorrow night on Spike TV Gray Maynard looks to start his UFC career off with a bang when he tangles with Rob Emerson on The Ultimate Fighter 5 Finale. In Atlantic City, New Jersey Kimbo Slice takes on former boxing Heavyweight Champion Merciless Ray Mercer. 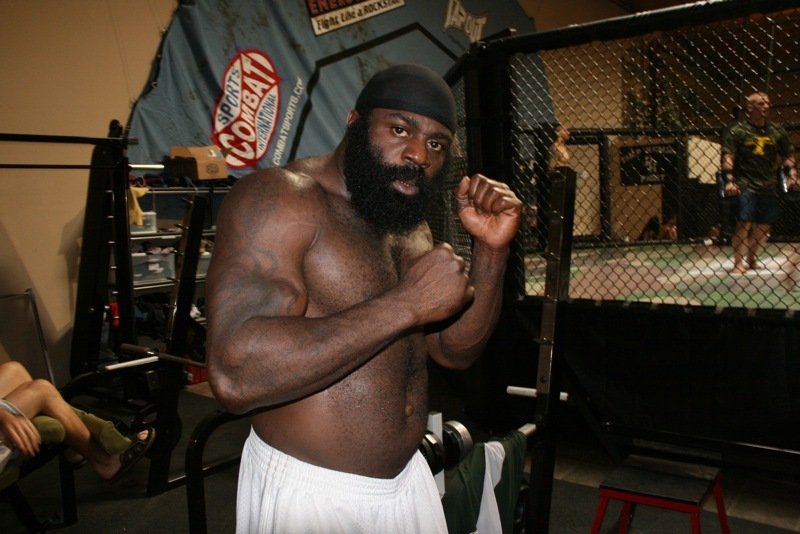 Kimbo is trained by Shawn Tompkins and spent time preparing for his fight at Xtreme Couture. Out in Ohio, Xtreme Couture grappling coach Dennis Davis is fighting, as is our pal Solomon Hutcherson. Good luck to the crew. Gina Carano the newest edition to the Xtreme Couture stable of fighters will be teaching Muay Thai Saturdays from noon to 1pm. The class will focus on techniques, as Joey Varner’s 10am-11am class becomes a sparring session overseen by the esteemed Mr. Varner. Gina will also be appearing on your TV sets tonight (June 12th) at 10:30pm eastern on Oxygen. It’s the debut episode of “Fight Girls” as show featuring Gina and Muay Thai legend Master Toddy training a bunch of up and coming young female kickboxers. Rumor has it Gina will step back in the cage for Elite XC on September 1st against Jen Finney. Their June 2nd fight was scrapped after Gina got ill during filming for Fight Girls in Thailand.